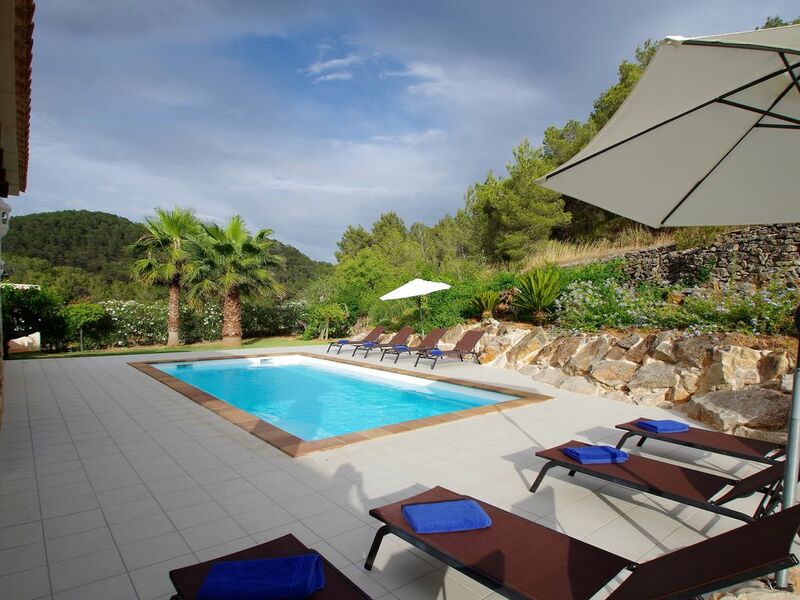 The place is a traditional ibizan countryside house with big stone walls and a tall wood roof that make the place keeps fresh and comfortable. It was totally renovated in 2007, making the place even more comfortable. Thanks to that, the house has got air conditioner and heating in every room, a modern and fully equipped kitchen, two terraces, one with a table for meals, swimming pool, outside barbecue and a beautiful garden. - One floor house with 170m2. - Living room with international TV, Wi Fi and DVD. - Two covered terraces with an outside dining area. - 2 double bedrooms with separate beds. - 1 double bedroom with a double bed, private bathroom with bathtub and dressing room. - 1 double bedroom with a double bed and a private bathroom with shower. - Other shared bathroom with bathtub. - 36 m2 swimming pool. - Air conditioner and heating in all the house. * Cradle and baby chair if necessary. We are an ibizan family that rent and manage directly our houses. We live on the island all the year, we love Ibiza and we hope to make your holidays happy and comfortable. Although the house is totally renovated, it still has an special charming about being a traditional house with approximately 300 years old. Also, the place is very well communicated with the town of Sant Josep (with all the basics like supermarkets, restaurants and shops) and also with all the south of the island, including beaches and other towns and cities. Get the best of the countryside but also from the urban areas. You can stay quietly on the house, without listening nothing more than the birds and the wind and when you want go to the bank, the supermarket or restaurants in just a five minutes. And if you prefer more, you can arrive to a lot of beaches in 10-20 minutes or in the cities of Sant Antoni or Ibiza. Great place , great location close enough to San Jose but still feels remote and away from it all. Had an amazing week in this great villa! Can’t recommend enough to anyone thinking of booking. Good communication with owners throughout booking and stay. Love San Jose and fab beaches minutes away by car. "The villa was fantastic! The reason for my low score for accommodation as compared to the description is that the advert did not show how nice the property was. The advert does not shoe the dining area or do justice to the outside area. We were extremely pleasantly surprised. The surrounding area was beautiful, the views of the forest were magical. We were also grateful that basic groceries were left for us - very helpful after arriving so late at night to have breakfast available. We had a great stay. Thank you." Mooi huis in een mooi omgeving. Het huis was erg fijn . Met kinderen en klein kind hebben we een fantastisch vakantie gehad. Ook de locatie was goed , lekker rustig maar toch dichtbij een dorp ( waar jij kon lopen als jij dat wilde).Voor minpunten moet jij heel veel zoeken en dat ga ik niet doen.Ik zou ongetwijfel weer naar dat adres gaan. The house is as nice as it looks like on the website. Great location near Sant Josep, fully equiped, with cleaning ladies in the middle of the location week. You can rent it without any doubt ! Many thanks to express your great opinion. I hope to see you next summer in Ibiza. Muchas gracias por su comentario, sus opiniones son fundamentales para nosotros y nos indican la linea seguir. Siempre serán bienvenidos en nuestra casa. "Vielen Dank für den tollen Aufenthalt in der wunderschönen Finca Es Verger. Das Haus ist sehr gut gelegen. Aufgrund der zentralen Lage ist alles schnell zu erreichen und der Ausblick vom Pool in die hügelige Landschaft ist wirklich toll. Das Haus ist sehr sauber und sehr komfortabel eingerichtet. Auch die Küche ist perfekt ausgestattet. Es ist alles da, was man zum Kochen für eine Großfamilie benötigt. Die Terrasse ist so gelegen, dass man Morgensonne und Abendsonne hat und dort perfekt frühstücken und zu Abend essen kann. Das Grundstück ist so gelegen, dass niemand Einblick hat und man daher den Pool und die Terrasse wirklich genießen kann. Wir hatten einen tollen Urlaub! Danke!!" follow directions for Sant Josep. Just a 10 minute drive takes you into San Antonio, famously known for it's clubs and nightlife, whilst a 20 minute drive puts you in the heart of Ibiza Town, perfect for shopping, sightseeing, clubs, bars and restaurants. .